21 October – 18 November 2017, Kurt Schwitters Merzbarn, Elterwater. Opening event from 6pm, Saturday 21 October. 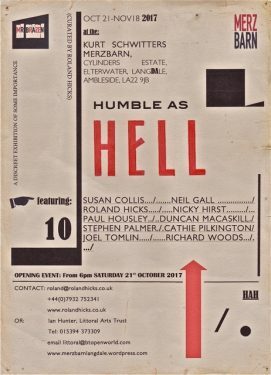 Susan Collis, Neil Gall, Roland Hicks, Nicky Hirst, Paul Housley, Duncan Macaskill, Stephen Palmer, Cathie Pilkington, Joel Tomlin, Richard Woods. The artist Kurt Schwitters was once described by the writer and curator John Elderfield as ‘curious for being so self-effacing and so supremely self-confident at one and the same time’. Humble As Hell brings together ten contemporary artists whose works address this same paradox in a number of different ways. The exhibition takes place at the site of Schwitters’ final creative project, in the English Lake District. This entry was posted in News on 14/10/2017 by admin.